I was busy. Busy finishing graduate school. Then busy being sick for several days. Then busy dealing with unforeseen troubles at — wait, why am I explaining myself to you? It’s a movie. Why are so many critics treating Nichols as some exciting new director, highlighting how talented he is for somebody so young? It’s been almost ten years since Shotgun Stories. Which is, by the way, still his best film. Fair enough, Amalgam. I’m excited. He’s on a streak. But your definition of “new” is interesting. You didn’t find Midnight Special to be understated and believable? Careful, spoilers. The opening scenes are so unusual and clever, you don’t want to ruin the surprises. It’s true. I got stuck in traffic, and got to my seat about 10 minutes into the movie. That’s never happened to me before. And I’m not happy about it. But I have it on good authority that those ten minutes are brilliantly executed. And anyway, as man-who-fell-to-earth stories go, Midnight Special seems pretty understated to me, and surprisingly human for long stretches of its running time. No argument there. But the more subtle they are, the stronger they are. I’m not crazy about the atomic-blast imagery in this film, but I will never forget a certain moment that involves a boy standing alone in a gas station parking lot, while something appears in the sky behind him. That… I’ve been dreaming about that scene since I saw it. Yeah, I think that the kid’s strangeness works because the effects are simple and effective, but also because of the way the adults respond to those moments of superhuman strangeness. I think the movie’s greatest strength, its big beating heart, is the father/son connection. 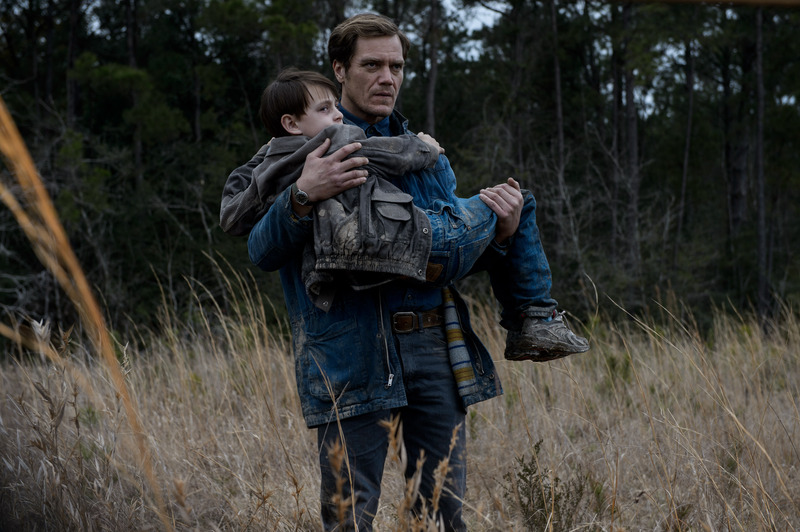 Roy (Michael Shannon’s character), and Alton (the boy played by Jaeden Lieberher) have a remarkably intimate and intense connection, considering how little they say to one another. I think it’s their physical relationship. We see Roy carrying Alton, suffering for and with him, physically shielding him. It’s rare that we see that kind of intimacy. And I think that’s a very, very good thing. Some of the strangeness comes from horror films as well as the classic ’80s sci-fi blockbusters. I can trace the DNA of multiple details in almost every scene. One scene in particular lifts an idea right out of David Lynch’s Twin Peaks: Fire Walk With Me. Lifts it right out of my favorite scene, in fact. But I’m not complaining. He’s not a copycat; he’s paying respectful and reverent homage to his influences. Nichols has a story all his own. You can tell he’s wanted to make this movie for a while. It really feels like he’s been staging some of these scenes for a long, long time. That’s why I find it kind of surprising that the film feels so… old-fashioned. Well, we’re getting old, Amalgam. But seriously — what is it that makes Midnight Special feel so… 1985? Okay, okay, I’ve heard those comparisons before. But I think there’s something substantially different going on here than what we get in Spielberg films about wonder. Instead of responding to Alton’s otherworldly powers with awe and ecstasy, these characters respond with grief — grief at their inability to save someone they love from forces beyond their control. The more magical he seems, the more he’s being taken away from the human sphere. And it works. That’s where the film manages to take hold of me. That’s what makes me care. I can’t answer that. I like things about Midnight Special. If you’re asking me if I think it’s a good science fiction movie, the answer is ‘No. It has great sci-fi moments, but it’s less than the sum of its parts.‘ That’s because when we finally discover what’s Really Going On, it doesn’t feel… revelatory. It’s just like ‘Here’s the ending we decided to go with.‘ It’s not something that fulfills the deeper questions raised by the movie. It’s not something that gets us any closer to understanding the Why of what this film is really about. But if you’re asking me if I value the movie, the answer is ‘Yes.‘ Because I think that what we see happening in the heads and hearts of the adults feels like genuine turmoil, genuine separation anxiety, genuine grief at the prospect of losing a child to something they don’t understand. Oh, it’s an intriguing variation! Definitely! Those moviegoers inclined to read films like these as Christian allegory will have a grand time with Midnight Special because it suggests that ‘The Kingdom is at hand‘ instead of saying ‘The Kingdom is way up in heaven and we’ll ascend to be there someday.‘ I like the novelty of that. I just wish it was a more satisfying conclusion for this story. I think a lot of the problems in the film are about just how how undercooked some of these supporting characters are. I wish they were more distinct — particularly Sarah, the mother played by Kirsten Dunst. Dunst gives us all she’s got, but ‘it’ isn’t very specific. She never develops into more than, you know, a very worried mom, anxious and sad. Only Michael Shannon’s Roy fully persuades me of what’s happening. And the farther the camera strays from Shannon, the more the film feels just like a variation on a formula. Driver’s good. I’m glad that Nichols lets his character be somewhat goofy. He’s like Keys from E.T., except Nichols doesn’t feel compelled to make him seem like a bad guy. There are. And they’re one of the film’s real weaknesses. They’re just dumbasses with guns. They’re surprisingly one-dimensional threats meant to keep the audience on edge. They don’t feel like Jeff Nichols characters. Shotgun Stories… you ask me what movie I would show people to get them thinking and talking about violence in America, and I would start with Shotgun Stories. He’s usually so sensitive about the role of violence in his films; but here, the guys with guns seem to be nothing more than a way to jack up the tension. No. I liked that it didn’t feel the need to give us an epilogue. It stayed focused on its central question: How will we respond when we realize just how far beyond our control the world really is? Midnight Special awakens our sense that there is much more is at work in the world than is dreamt of in our philosophy. But you know what I mean? That moment — the boy, standing in the parking lot, and then you see what’s happening, out of focus, in the distance? It feels scary, but it feels true. That’s what got into my dreams last night. I was sitting on a mountainside with a large crowd of friends, like we were all on some kind of retreat, and I suddenly noticed something going wrong with the sky. And I knew, in my heart, that it was the end of the world. It was a paralyzing feeling — feeling as though we are all witnesses, like an audience, for the end of the world. No, but it was one of those moments, you know? Moments when you are so captivated, so scared and enthralled, that you forget you’re watching a movie. I haven’t experienced many moments like that since I first saw Close Encounters of the Third Kind. Midnight Special may not be the most satisfying narrative, but it delivers moments that are the reason I go to the movies. Moments that kindle my faith in a world far more extraordinary than what we usually assume. Moments that make me want to resist going home to my routines. After seeing this, I just wanted to get in the car and drive all night, out of the city, into the unknown, eager to witness strange and mysterious things. It made me want to hit the road and flee all surveillance, all networks, all technology. It made me want to step out into those ambiguous spaces of storytelling where we discover things that are unsettling and new. That’s worth the price of a ticket.